Today we continue unveiling our team-by-team breakdowns, in roughly the reverse order of where we expect these teams to finish in the conference standings. Strengths. 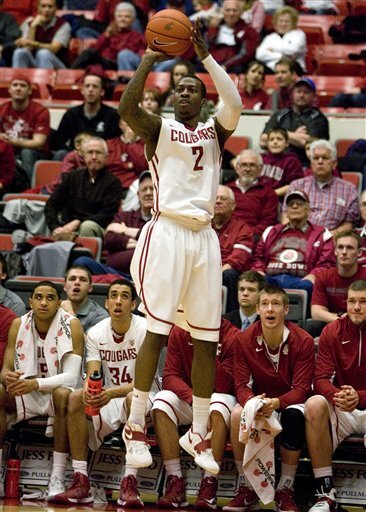 What this Washington State team lacks in talent, it makes up with effort and outside shooting ability. The Cougars feature a solid backcourt, headlined by a pair of juniors who will share duties at the one and two. Royce Woolridge and DaVonte Lacy both averaged double figure scoring last season, and true freshman Ike Iroegbu out of Oak Hill Academy (VA) will add some depth, but may not be able to be counted on right away. The challenge will be finding a good distributor for the trio. Junior point guard Danny Lawhorn, the nation’s leader in assists last year at San Jacinto Junior College, was supposed to be that guy, but he left Washington State two weeks ago after being suspended for a violation of team rules in late September. Weaknesses. Like I said above, this team has a serious lack of talent. The Cougars only won 13 games last year, and that was with guys like Brock Motum and Mike Ladd on the roster. The four and five spots will be the weakest for Washington State, as head coach Ken Bone will have a tough time finding players who can consistently produce. 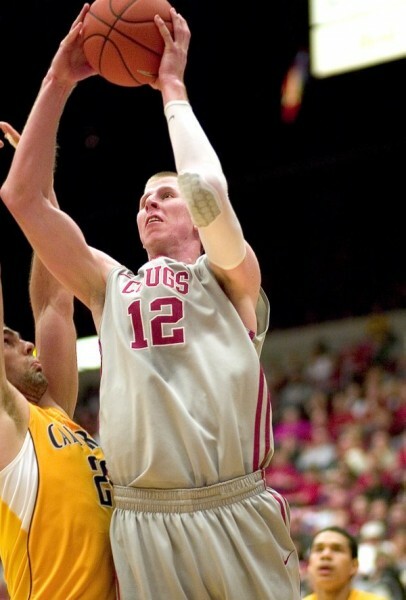 They will rely on Iowa State transfer and Beaverton, Oregon, product Jordan Railey at center, and senior D.J. Shelton returns to start at power forward. Former walk-on Will Dilorio will see a lot of time at the three, and that should give you an idea of just how thin the Cougars are up front. Now that we are officially in the offseason, it’s time to take a look back and evaluate each team’s 2012-13 performance. Here’s a look at Washington State. Let’s first stipulate that we’re talking about a team that went 13-19 and finished tied for last place in the Pac-12 this season. Given those parameters, the Cougars actually had some big things go well for them. Mike Ladd, in his senior season, stepped into a leadership role, played out of position quite a bit at the point, and was really good; DaVonte Lacy shook off a couple injuries and a dreadful midseason slump (16-of-63 from the field in the first half of conference play) to take an overall step forward in his game; and Royce Woolridge shook off early inconsistency and lack of confidence to put together a terrific back stretch, going for 16.5 points per game over the last 12 games of the schedule. Considering Wooldridge and Lacy will be back next year and the focal points of that team, Washington State fans are able to take at least something positive away from this season. When head coach Ken Bone dismissed senior point guard Reggie Moore just in advance of the season, you knew this team –without any obvious answers to take Moore’s place – was going to have some problems. And perhaps senior forward Brock Motum, one of the conference’s best and most efficient players in 2011-12, may have been hit the hardest. As the focal point of the offense, Motum certainly didn’t have a bad season (18.7 PPG, 6.3 RPG), but he definitely had to work a lot harder for his production without the services of a floor general to set him up in all the right spots. Bone got the best out of a bad situation, receiving point guard production from a committee including Ladd, Woolridge and Lacy, but none of those three were ever truly dialed in at the one. The regular season is behind us, so today we award our final weekly honors for the Pac-12. Doing a little housecleaning before we get to this week’s honorees, for the year, Arizona won our Team of the Week more often than anybody else, earning four nods, including three straight way back in the non-conference slate. Unfortunately for Sean Miller and company, they haven’t been the best team in the conference since Week 12, back at the end of January and the start of February. As far as Player of the Week honors, we’ve had 14 different players win the award at least once, with three guys earning two nods – Justin Cobbs, Allen Crabbe and C.J. Wilcox. The Newcomer of the Week has been slightly less muddy, with only 12 different players earning that nod. But that award has definitely been dominated by one guy – no, not Shabazz Muhammad, who only won the award once – but Arizona State’s Jahii Carson, who won the award five times this year, perhaps a hint at the winner when we announce our Freshman of the Year later today. It took all year long, but somehow the Cougars have finally started to hit their stride just as the season ends. For the first time all season, they swept a conference home stand, dispatching both of the Los Angeles schools with relative ease. Even more impressively, they won both of those games sans guard DaVonte Lacy and with senior guard Mike Ladd only returning for the final game. The Cougs remain a long shot to do much damage in the conference tourney, but they sure are hitting their stride at just the right time. Pac-12 Burning Questions: Most Improved Senior? Our Pac-12 commentators are back with their answers to the biggest questions around the conference. This week, who is the most improved senior in the league? Adam Butler: There was plenty of hype surrounding Solomon Hill. He was a top 50 player being likened to other Wildcat point-forwards like Richard Jefferson, Andre Iguodala, and Luke Walton. Sure that list is eclectically pieced together but the fact remains that Hill’s skill set was such that he could score, board, and dish. And it sounded great. But then Lute wasn’t the coach. And then he was. And then he wasn’t and Hill’s commitment to Arizona followed the same course until he finally settled on his hometown Trojans. Following Arizona’s 2009 season in which they made the Sweet Sixteen, a coaching hunt ensued. It wasn’t the prettiest thing but it landed Sean Miller in Tucson and the rest is history in the making. Of course Hill’s path back to Tucson wouldn’t make much sense without, say, an NCAA scandal (he was not involved) and the subsequent quitting of his USC coach and release from his LOI. 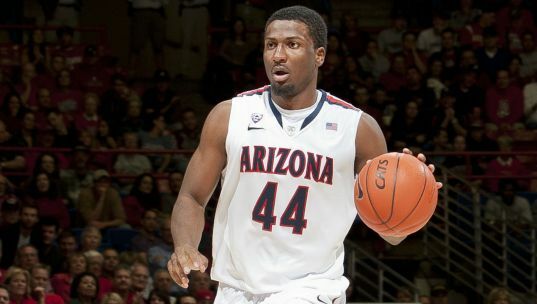 Now wrapping up his collegiate career, Solomon Hill is on the brink of helping the Wildcats earn a Pac-12 title. Soon on his doorstep was Arizona’s new lead man and, among the now-fabled 2009 recruiting class to join Sean Miller for year one in Tucson, Hill was the first to commit. But he was overweight and undercommitted, perhaps waltzing in with a sense of entitlement. His freshman year looked something like this: 6/4/2. He made four three-pointers. Today he’s widely considered one of the most complete players in the conference, going for 14/6/2 while connecting on 40% of his threes of which he’s made 46 attempts. Solomon has endured and blossomed in the most interesting of times for Arizona basketball and has carried the torch into the new era. He (along with fellow senior, Kevin Parrom) will be the first four-year players under Miller to move through the program. Their senior day will be bittersweet but it won’t be a farewell. After all, Miller calls it a “player’s program.” Solomon Hill embodies that program. Professor Pac isn’t pleased with all of his pupils. Four teams will be spending time in detention this week for their misdeeds in their most recent performances. Two home losses equal the Cougars third D+ of the year. A really, those grades have probably only been that high out of pity. Focus on: Brock Motum. There are plenty of problems around Pullman, but perhaps the biggest one is the lack of enough offensive playmakers to create quality looks for and distract opponents from focusing on Brock Motum. While the senior Aussie has still produced at a laudable rate (he’s averaging 18.3 points per night and hasn’t failed to score in double figures yet this season), he’s had to put in much more work to accomplish what he has and as a result, his efficiency has suffered. Only twice in conference play has he delivered a game with an eFG% better than 50% and he’s probably spending too much time bombing from three. Looking ahead: The Cougs travel to the Los Angeles schools this week where they’ll need Motum to get help from guys like Mike Ladd, DaVonte Lacy, and Royce Woolridge to have a chance at a successful weekend. Five weeks into conference play and this is the Beavers’ second-highest weekly grade. Suffice it to say, this semester is not going well for them. This week they got solid offensive performances, rebounded the ball particularly well and still, just couldn’t stop anybody, giving up 1.23 points per possession. For the year, the Beavers have far and away the worst defense in the conference; they’re the only team in the conference with an adjusted defensive efficiency higher than 100. And that’s happening with two of the longest, most athletic, dialed-in defensive players in the conference in Eric Moreland and Devon Collier. Craig Robinson has been mostly trying to play man-to-man defense, but this weekend we saw much more of his 1-3-1 defense. With Moreland at the point of the attack here and with the ability to sort of hide Joe Burton in the middle, this may be the best solution for the Beavers. Focus on: Joe Burton. Speaking of Burton, he may not be even remotely useful on the defensive end, but he sure is a fun watch when the Beavers have the ball. He’s got the prototypical old man game. I’m not sure he could leap over an iPhone, but he does a great job of carving out space for himself with his 300-pound frame, he’s got great vision, he’s capable of making spectacular passes and will occasionally even break out the sky hook. This week he averaged 15.5 points, nine rebounds and 6.5 assists per game. Yeah, so he probably assisted in giving up 30 points a game, but it was entertaining at least. Looking ahead: The Beavers have 11 losses, but only once all season (the Pac-12 opener against Oregon) have they lost by more than ten points. In other words, they’re going to keep things close, they’re going to play entertaining games and they’re going to continue to be worth watching. And, somewhere along the line here, they’re going to string a couple of wins together, even if by accident. This week they host Utah and Colorado. They can win those games. 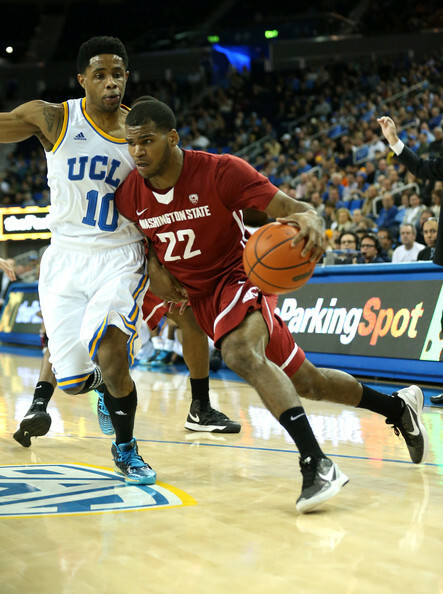 Ben Howland says conference play this year will be a dogfight. He’s certainly been right thus far as Arizona State/Utah went to overtime on Wednesday, Colorado/Arizona did the same last night, and USC/Stanford came down to the final seconds as well. Howland also mentioned how Shabazz Muhammad, despite coming into the season out of shape, has turned it around quickly and making a major impact. 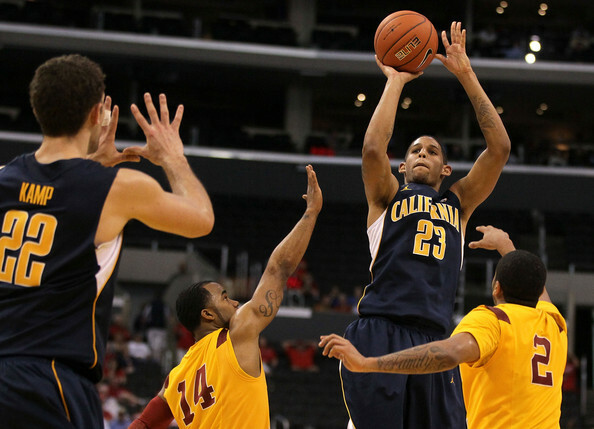 Muhammad followed up his 27-point performance against Missouri with a 16-point performance against Cal last night. Going forward, the Bruins will certainly need him and other freshman standouts Kyle Anderson and Jordan Adams to achieve the success that Ben Howland and the Bruins hoped for this season. Sean Miller had only good things to say about numerous teams before the start of conference play. Miller praised the strong defense of Oregon, noted that Stanford and California both had veterans and great coaches, and also said that UCLA might have the most potential out of all Pac-12 teams. Miller is most concerned with his own team now, though. He was worried about his team’s defense and three point shooting, which were both issues again in last night’s game with Colorado, and he was also concerned in his team’s ability to feed the post, something that wasn’t a problem against the Buffaloes. It’s safe to say that after last night’s comeback victory, Miller will continue to have concerns with his team despite its undefeated record. Lorenzo Romar finds himself in the same spot he was last year entering conference play. After losing three home games, with the most embarrassing one coming against Albany, and only beating two solid teams in Seton Hall and Saint Louis, the Huskies now find themselves in a familiar place. Last year, Washington began conference play with a lowly 6-5 record considering the talent they had, but won 13 of their last 16 games in conference playto pull out a Pac-12 regular season title. Romar has said he isn’t concerned with repeating the feat, but rather reaching the potential that this team has and seeing where that takes them. Washington State hasn’t had a lot of things go right for them this year, but the one constant for Ken Bone has been Brock Motum. Motum is averaging 19.7 points per game this season and has scored 23 points or more in five straight games. Bone has said that Motum could stand to improve on his defense and rebounding, but he has certainly gotten much better in both of those areas since his freshman year. Although Motum hasn’t been on the ESPN or DraftExpress top 100 prospect lists for next summer’s draft, Motum still has faith that he can play in the NBA one day and others, most notably, Gonzaga coach Mark Few, believe so too. Referees aren’t always to blame for losses, but it sure seemed like that was the case in Colorado‘s overtime loss to Arizona last night. Sabatino Chen hit a game-winning three as time expired that the referees initially ruled as good, but when they went to the monitors to review the play, they overturned it which sent the game to overtime. Most commentators think they blew the call because it looked good on replay, however, that might not be the case. NBC Sports‘ Rob Dauster believes that after multiple looks, the video image seems to be too blurry to overturn the call. According to the rules, if the video is inconclusive, then the initial ruling on the court stands, which would have/should have given Colorado the huge road victory. Later tonight, the second leg of the Pac-12 college basketball season begins as conference play tips off with the Battle of the Bachynskis, when Utah travels to Arizona State. After last year’s nightmare of a non-conference slate, this season the conference took major strides, with Arizona’s win over Florida, UCLA’s win over Missouri, Colorado’s win over Baylor, and Oregon’s win over UNLV making up the top tier of the best wins for the conference. Before we turn our complete attention to conference play, we thought we’d hand out some awards based on the season to this point, so Connor Pelton, Parker Baruh, Pachoops’ Adam Butler and myself voted and came up with the following results. Allen Crabbe, Jr, California – Crabbe’s 20.9 PPG and efficient all-around offensive game earned three of the four votes for our player of the year, with UCLA’s Jordan Adams receiving the other vote from me. Crabbe has been a rock for the Golden Bears (well, aside from that Creighton debacle, at least), scoring in double figures in every game, helping out on the glass and, thus far, knocking down better than 38% of his shots from deep. Dana Altman, Oregon – Despite losing three of last year’s top four scorers, and having the other guy in that quartet – E.J. Singler – struggle through the early part of this year, the Ducks have reeled off wins in 11 of their 13 games. Altman has gotten great production out of his freshman backcourt of Dominic Artis and Damyean Dotson, has folded Rice transfer Arsalan Kazemi into the mix seamlessly, and coaxed great improvement out of senior center Tony Woods. As a result, he earned three of our four votes for the COY, while Arizona State’s Herb Sendek got my support. Shabazz Muhammad, Fr, UCLA – After missing the first three games of the season due to an NCAA investigation into his eligibility, Muhammad has come on strong for the Bruins, scoring in double figures in all 10 of the games he’s played in on his way to 19.6 points per night. He’s just beginning to ease into the best physical shape of the season, so the expectation is that conference play will see an even better version of Shabazz. Once again, Shabazz earned three of our four votes for FrOY, with the lone dissenter (again, me) nabbing teammate Jordan Adams. Before Sean Miller‘s head coaching career started, he was a part of a group of successful assistants at Xavier under Thad Matta, who is now the current head coach at Ohio State. Several of these assistants like Miller are now head coaches and include John Groce at currently undefeated Illinois as well as Alan Major at currently undefeated Charlotte. Miller noted that all the coaches learned so much from Matta, but most important was the ability to bring out the best in a team by making sure that everyone is enjoying themselves throughout the entirety of the season. Ben Howland has a career 211-99 record at UCLA and has enjoyed considerable success, but this year the Bruins’ poor start can be attributed to three mistakes. Howland has played the Wear twins too much, and although he gives them constant praise, the reality is that the David and Travis Wear have their limitations on defense and have no consistency on offense — Travis has only put up 14 points in his past two games while David has put up a total of four. Howland also hasn’t found the right fit for freshman Kyle Anderson. With Larry Drew II handling the point guard duties, UCLA hasn’t been able to run a successful offense with Anderson playing off the ball. Lastly, even with the #1 recruiting class this season, Howland has failed to find his staple of tough interior defenders such as previous Bruins Luc Richard Mbah a Moute, Alfred Aboya, and Lorenzo Mata-Real, any of whom UCLA could so desperately use this season. Washington is scheduled to play Seattle University this Thursday, but the Huskies are likely to be without freshman point guard Andrew Andrews as he is still suffering from a sprained ankle. Andrews is currently averaging seven points and 3.3 assists per game this year and Washington could use his help with Lorenzo Romar’s team continuing to struggle as evident by their recent home loss to Nevada and their near home loss to Cal State Fullerton in the past two games. With the early dismissal of Reggie Moore from Washington State this year, Ken Bone knew he would need a replacement at point guard and has turned to sophomore Royce Woolridge to handle the position. But it’s been senior Mike Ladd who has taken the reins in recent games. Bone praised Ladd, but said that the duties will continued to be shared regardless. Additionally, Bone has been pleased so far this year with star player Brock Motum’s improvement on the defensive end as he has become much better defending the post. Last year, the Pac-12 only had two NCAA Tournament teams in Cal and Colorado who were unable to advance past the round of 32, but esteemed bracketologist Joe Lunardi came out with his latest mock yesterday and he had six Pac-12 teams currently invited into his field of 68. Arizona was a three seed, Colorado was a seven seed, Cal was a nine seed, Oregon was a ten seed, and UCLA and Stanford were twelve seeds. Although it’s only December and things will certainly change in the next three months of action, it’s still impressive to see the Pac-12 putting half its teams in the draw considering the conference’s recent inability to get more than a couple into the NCAA Tournament.